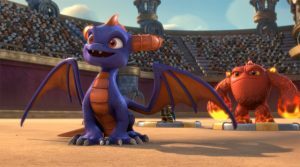 Skylanders Academy is a new CGI animated series set to premier this month on Netflix. According to the Skylanders Wiki (yes there is one), the series is being produced by Activision Blizzard Studios under the guidance of Eric Rogers (writer on Futurama). Spyro the dragon, Eruptor, and Stealth Elf study to use their diverse powers to protect their world from the evil forces of Kaos and the Doom Raiders. Look for it October 28th, and check out the trailer on YouTube.